DIE Lunæ, videlicet, 25 die Julii. Joan Brady 5l. Contribution money. Message from the H. C. for Expedition to the Order for Arms for Ireland. E. Warwick's Letter, about some Merchant Strangers Ships lately taken by the Dutch; and that he had stopped some Dutch Ships, on that Account, till he received the Parliament's Direction. Sir Thomas Cary, and Bp. of Ardagh. 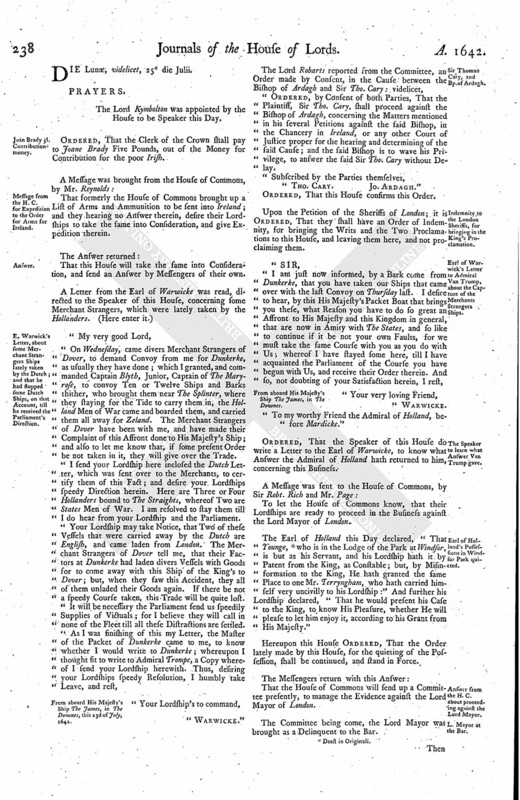 Indemnity to the London Sheriffs, for bringing in the King's Proclamation. Earl of Warwick's Letter to Admiral Van Trump, about the Capture of the Merchants Strangers Ships. The Speaker to learn what Answer Van Trump gave. Earl of Holland's Possessions in Windfor Park quieted. Answer from the H. C. about proceeding against the Lord Mayor. L. Mayor at the Bar. Proceedings against him by the H. C.
The Lord Kymbolton was appointed by the House to be Speaker this Day. Ordered, That the Clerk of the Crown shall pay to Joane Brady Five Pounds, out of the Money for Contribution for the poor Irish. That formerly the House of Commons brought up a List of Arms and Ammunition to be sent into Ireland; and they hearing no Answer therein, desire their Lordships to take the same into Consideration, and give Expedition therein. That this House will take the same into Consideration, and send an Answer by Messengers of their own. On Wednesday, came divers Merchant Strangers of Dover, to demand Convoy from me for Dunkerke, as usually they have done; which I granted, and commanded Captain Blyth, Junior, Captain of The Maryrose, to convoy Ten or Twelve Ships and Barks thither, who brought them near The Splinter, where they staying for the Tide to carry them in, the Holland Men of War came and boarded them, and carried them all away for Zeland. The Merchant Strangers of Dover have been with me, and have made their Complaint of this Affront done to His Majesty's Ship; and also to let me know that, if some present Order be not taken in it, they will give over the Trade. I send your Lordship here inclosed the Dutch Letter, which was sent over to the Merchants, to certify them of this Fact; and desire your Lordships speedy Direction herein. Here are Three or Four Hollanders bound to The Straights, whereof Two are States Men of War. I am resolved to stay them till I do hear from your Lordship and the Parliament. Your Lordship may take Notice, that Two of these Vessels that were carried away by the Dutch are English, and came laden from London. The Merchant Strangers of Dover tell me, that their Factors at Dunkerke had laden divers Vessels with Goods for to come away with this Ship of the King's to Dover; but, when they saw this Accident, they all of them unladed their Goods again. If there be not a speedy Course taken, this Trade will be quite lost. It will be necessary the Parliament send us speedily Supplies of Victuals; for I believe they will call in none of the Fleet till all these Distractions are settled. From aboard His Majesty's Ship The James, in The Downes, this 23d of July, 1642. "Ordered, by Consent of both Parties, That the Plaintiff, Sir Tho. Cary, shall proceed against the Bishop of Ardagh, concerning the Matters mentioned in his several Petitions against the said Bishop, in the Chancery in Ireland, or any other Court of Justice proper for the hearing and determining of the said Cause; and the said Bishop is to wave his Privilege, to answer the said Sir Tho. Cary without Delay. Ordered, That this House confirms this Order. Upon the Petition of the Sheriffs of London; it is Ordered, That they shall have an Order of Indemnity, for bringing the Writs and the Two Proclamations to this House, and leaving them here, and not proclaiming them. From aboard His Majesty's Ship The James, in The Downes. "To my worthy Friend the Admiral of Holland, before Mardicke." Ordered, That the Speaker of this House do write a Letter to the Earl of Warwicke, to know what Answer the Admiral of Holland hath returned to him, concerning this Business. To let the House of Commons know, that their Lordships are ready to proceed in the Business against the Lord Mayor of London. The Earl of Holland this Day declared, "That Younge, (fn. 1) who is in the Lodge of the Park at Windsor, is but as his Servant, and his Lordship hath it by Patent from the King, as Constable; but, by Misinformation to the King, He hath granted the same Place to one Mr. Terryngham, who hath carried himself very uncivilly to his Lordship:" And further his Lordship declared, "That he would present his Case to the King, to know His Pleasure, whether He will please to let him enjoy it, according to his Grant from His Majesty." Hereupon this House Ordered, That the Order lately made by this House, for the quieting of the Possession, shall be continued, and stand in Force. That the House of Commons will send up a Committee presently, to manage the Evidence against the Lord Mayor of London. The Committee being come, the Lord Mayor was brought as a Delinquent to the Bar. Then Mr. Serjeant Wylde proceeded upon the Article on the Second Impeachment, concerning a Petition which the Lord Mayor had a Hand in contriving of it, which was against the Militia. Affidavit was made, "That Mr. Wiseman is not to be found; but, as it is said, he is gone to Yorke:" Therefore it was desired, "That the Examination of Mr. Wiseman, formerly taken before the Lords Committees concerning this Cause, might be read, because it was suspected he was sent away by the Lord Mayor." And after a Debate; it is Ordered, That the House of Commons do [ (fn. 3) go on] with the rest of their Evidence; and this House will take the Examination of Mr. Wiseman into Consideration hereafter. 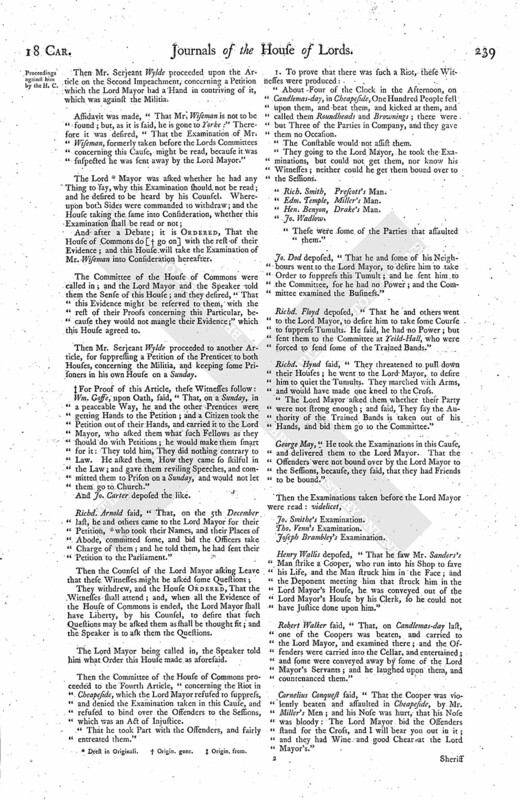 The Committee of the House of Commons were called in; and the Lord Mayor and the Speaker told them the Sense of this House; and they desired, "That this Evidence might be reserved to them, with the rest of their Proofs concerning this Particular, because they would not mangle their Evidence;" which this House agreed to. Then Mr. Serjeant Wylde proceeded to another Article, for suppressing a Petition of the Prentices to both Houses, concerning the Militia, and keeping some Prisoners in his own House on a Sunday. (fn. 4) For Proof of this Article, these Witnesses follow: Wm. Goffe, upon Oath, said, "That, on a Sunday, in a peaceable Way, he and the other Prentices were getting Hands to the Petition; and a Citizen took the Petition out of their Hands, and carried it to the Lord Mayor, who asked them what such Fellows as they should do with Petitions; he would make them smart for it: They told him, They did nothing contrary to Law. He asked them, How they came so skilful in the Law; and gave them reviling Speeches, and committed them to Prison on a Sunday, and would not let them go to Church." And Jo. Carter deposed the like. Richd. Arnold said, "That, on the 5th December last, he and others came to the Lord Mayor for their Petition, (fn. 2) who took their Names, and their Places of Abode, committed some, and bid the Officers take Charge of them; and he told them, he had sent their Petition to the Parliament." 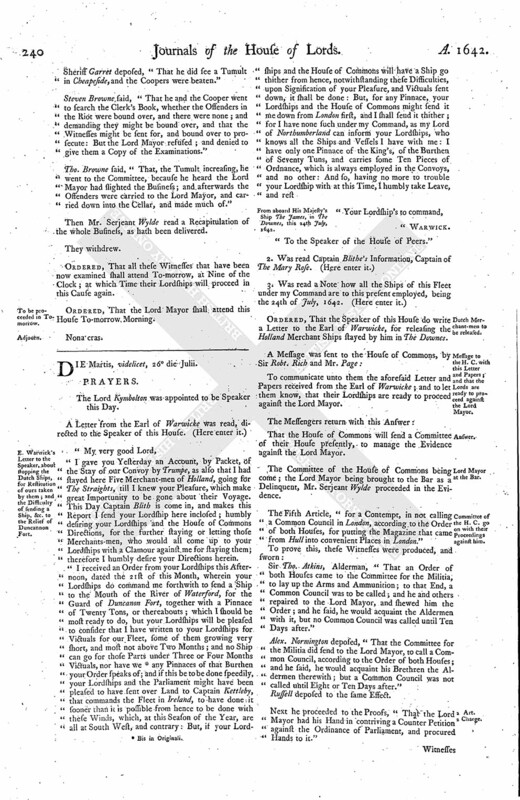 They withdrew, and the House Ordered, That the Witnesses shall attend; and, when all the Evidence of the House of Commons is ended, the Lord Mayor shall have Liberty, by his Counsel, to desire that such Questions may be asked them as shall be thought fit; and the Speaker is to ask them the Questions. The Lord Mayor being called in, the Speaker told him what Order this House made as aforesaid. Then the Committee of the House of Commons proceeded to the Fourth Article, "concerning the Riot in Cheapeside, which the Lord Mayor refused to suppress, and denied the Examination taken in this Cause, and refused to bind over the Offenders to the Sessions, which was an Act of Injustice. "That he took Part with the Offenders, and fairly entreated them." About Four of the Clock in the Afternoon, on Candlemas-day, in Cheapeside, One Hundred People fell upon them, and beat them, and kicked at them, and called them Roundheads and Brownings; there were but Three of the Parties in Company, and they gave them no Occasion. The Constable would not assist them. They going to the Lord Mayor, he took the Examinations, but could not get them, nor know his Witnesses; neither could he get them bound over to the Sessions. "These were some of the Parties that assaulted them." Jo. Dod deposed, "That he and some of his Neighbours went to the Lord Mayor, to desire him to take Order to suppress this Tumult; and he sent him to the Committee, for he had no Power; and the Committee examined the Business." Richd. Floyd deposed, "That he and others went to the Lord Mayor, to desire him to take some Course to suppress Tumults. He said, he had no Power; but sent them to the Committee at Yeild-Hall, who were forced to send some of the Trained Bands." Richd. Hynd said, "They threatened to pull down their Houses; he went to the Lord Mayor, to desire him to quiet the Tumults. They marched with Arms, and would have made one kneel to the Cross. "The Lord Mayor asked them whether their Party were not strong enough; and said, They say the Authority of the Trained Bands is taken out of his Hands, and bid them go to the Committee." George May, "He took the Examinations in this Cause, and delivered them to the Lord Mayor. That the Offenders were not bound over by the Lord Mayor to the Sessions, because, they said, that they had Friends to be bound." Henry Wallis deposed, "That he saw Mr. Sanders's Man strike a Cooper, who run into his Shop to save his Life, and the Man struck him in the Face; and the Deponent meeting him that struck him in the Lord Mayor's House, he was conveyed out of the Lord Mayor's House by his Clerk, so he could not have Justice done upon him." Robert Walker said, "That, on Candlemas-day last, one of the Coopers was beaten, and carried to the Lord Mayor, and examined there; and the Offenders were carried into the Cellar, and entertained; and some were conveyed away by some of the Lord Mayor's Servants; and he laughed upon them, and countenanced them." Cornelius Conquest said, "That the Cooper was violently beaten and assaulted in Cheapeside, by Mr. Miller's Men; and his Nose was hurt, that his Nose was bloody: The Lord Mayor bid the Offenders stand for the Cross, and I will bear you out in it; and they had Wine and good Chear at the Lord Mayor's." Sheriff Garret deposed, "That he did see a Tumult in Cheapeside, and the Coopers were beaten." Steven Browne said, "That he and the Cooper went to search the Clerk's Book, whether the Offenders in the Riot were bound over, and there were none; and demanding they might be bound over, and that the Witnesses might be sent for, and bound over to prosecute: But the Lord Mayor refused; and denied to give them a Copy of the Examinations." Tho. Browne said, "That, the Tumult increasing, he went to the Committee, because he heard the Lord Mayor had slighted the Business; and afterwards the Offenders were carried to the Lord Mayor, and carried down into the Cellar, and made much of." Then Mr. Serjeant Wylde read a Recapitulation of the whole Business, as hath been delivered. Ordered, That all these Witnesses that have been now examined shall attend To-morrow, at Nine of the Clock; at which Time their Lordships will proceed in this Cause again. Ordered, That the Lord Mayor shall attend this House To-morrow Morning.